This video gives a general overview of the hundreds of Proposal Kit products, how they work and what kinds of content is included. It shows how the Windows and Mac interfaces work and how they tie into the automated Word for Windows add-in software interface. Also covered is how the Proposal Packs are designed for their visual design look and where they are similar and how they are the same across all the design themes. In this video we're going to go over some of the differences and some of the similarities between the different Proposal Kit products. Proposal Kit has hundreds of products. Mostly they are differences in just graphic design themes applied to the pages of a common set of proposal templates so the look of the proposal templates will be different based on what products you ordered. First up, our most common is our Proposal Pack for Any Business. This is the best design theme to use if you want your templates to be plain black and white - very conservative looking. It's the best design for branding with your own logo, your own color scheme and for government proposals. Another design theme - this is our Environmental #3. It is an example of one of our design themes with a line art graphic design. Another one we'll show is our Marketing #1 design. This is an example of one that uses a photo design theme. We're also showing the Proposal Pack desktop organizer. This is the red icon you see on your desktop for browsing through all the templates. There is an optional interface which you use for custom building and customizing which is called our Wizard interface. We'll get to that later, this video is mainly focused on just showing the differences between the Packs and how things in general work and what's included. So using this desktop organizer there are thousands of templates included and hundreds of samples, also a collection of preassembled documents for common situations. To get to samples you can just scroll down the sample links, open up any given sample you can view as a PDF document. If you scroll down the sample you'll see all of the content. Now these samples are all PDF documents that are meant for viewing in the browser organizer. The wizard interface does give the ability to create editable Word versions of all these samples in the design theme that you actually purchased. Also in the desktop organizer everything is organized by categories. There are thousands of individual chapter templates. How these templates are assembled in a certain order in a certain number you can create anything from business proposals, RFPs, business plans, reports, studies and so on. Pretty much any kind of business document you need that has a series of pages, a table of contents, you can create using the Proposal Pack. It's not just for proposals. You can get to all these chapters using this desktop organizer and browsing by the kinds of ways you might want to find certain types of information. So you want to find chapters that are IT related you can browse by categories or say we want some real estate chapters. All of these chapters are individual pages that you can assemble together as a group into a complete proposal. This gives you the ability to custom assemble any kind of proposal for any kind of situation. If you need a 5-page proposal - you might need an 80-page proposal. Now what we have done is preassembled some of those chapters into complete documents. Those you can get through the preassembled documents page. We've preassembled documents for business proposals, business plans, a short quote, a general services contract and nonprofit funding proposal template, a feasibility study and a resume. What you can do is open any of these Word documents and just edit it as a standalone Word document or customize it by pasting in additional chapters that you can find through the rest of these categories. The wizard software is more efficient at pasting pages together into more customized documents than these preassembled ones. Also you'll find instruction manuals on how to use the Proposal Packs. To show some of the differences between these Packs we'll open the business proposal preassembled document for each of these three designs. These are just three out of hundreds of designs that are available, plus you can create your own design theme using our Expert Wizard software. Now we're using the Firefox browser right now. Depending on what browser you're using it may operate slightly differently. Some browsers - say Internet Explorer/Edge might ask you if you want to download the Word documents as you click these links. You're not actually downloading anything, it's just opening it from a folder on your own hard drive in that case. Other browsers, say maybe Safari on the Mac might actually just open a folder where that document is located with that document highlight that you then have to double click that document in the folder to fully open it. So depending on your browser and your operating system you'll see slight differences in how this interface operates. Okay, so we have the document for the plain Proposal Pack for Any Business open. Now we'll open the one for the Environmental #3 design and we'll open the one for the Marketing #1 design. Now we have 3 Word documents open. You'll see the cover letter actually looks the same between all 3 because the introduction Cover Letter is always designed to be a plain text page. Next is what we call our Title Page or what we call our Title Page is basically the front cover. It has the most graphic design and it has contact information, a short title and maybe a short description paragraph that helps introduce your overall proposal. So you can see between three different design themes most of the information is the same and they all follow a similar format. You have a big word Proposal with the logo and in general your own logo if you're going to insert your own logo gets put in this place where you see the our word Proposal. Then you have the title, maybe a date, prepared for, prepared by, a description. Our photo design themes are a little more simplified just because there's less white space. But you'll see how we pick a design theme based on the situation and your personal visual look of your choice. The actual information is the same and how you fill in these pages is going to define your final proposal. So we have the Table of Contents next. Now our Wizard will actually generate a real Word object Table of Contents so as you change your proposal, you change chapters, your page numbering changes you simply update the Table of Contents and all your pages will renumber automatically. You can see a watermark graphic kind of in the background, icon in the footer and each page has a big header. You can see the differences are all visual - colors graphics, pages with tables say like your Cost Summary have a color scheme that matches as well and you can set these color schemes yourself. All these are Word tables you can edit. The cells and all the colors, and our Wizard software will actually let you set your own color scheme and it will process your document as it's being assembled and apply your custom color scheme in place of ours across every page of the document. Everything you can do in the Wizard you can also do manually just using your word processor. The Wizard Word for Windows interface is simply more efficient. Okay, now that you've seen how our Proposal Packs are the same and how they differ, they basically only differ in colors and graphics - the visual design. All the text that you're going to be replacing with your own information is actually the same for different types of businesses whether you're in security, IT, medical, construction, accounting, website development, it doesn't matter. In the library of thousands of chapter templates there are specialty chapters for every kind of business. So say if you're writing an IT proposal you'll find a lot of chapter templates that are IT related you can build your document with. If you're writing a medical related or healthcare related proposal there are many templates specific to medical and healthcare issues. Same for all of the types of businesses. You know there's a lot of chapter templates available for construction and real estate. How you pick all your chapters and assemble them and then how you pick a design theme results in your final document being very specialized to you and your situation. Everything is also customizable. You can replace these graphics with your own. This is why it's best to use this Proposal Pack for Any Business design if you are really intending to customize the visual look yourself to match your own company logos and colors. It's easier to start with this one and build up your design than to start with one of our pre-made designs and convert it. Either way works. Now that you've seen how the templates are the same and how they differ we can look at a couple sample proposals. The templates give you documents ready for you to edit and insert your own information. A lot of people especially new proposal writers would like to see examples of finished proposals so Proposal Kit includes hundreds of actual completed samples that other people have written. How they've started with a one specific design theme, picked a set of chapters, assembled them together and then filled in the details and that end result is what you see in these samples. So say if I want to see an example of an IT related proposal. We can look at the network and cabling sample. Every sample starts with an information page that shows you all the chapter templates that were used to assemble the initial proposal document, which one of the design themes was used and then you see the finished filled in sample. So you can create your own version of this sample editable in any design theme. This is using the Network #1 design theme but you can recreate the same sample using any of our design themes or even a customized theme that you've customized with your own color scheme and logo. Every sample comes with a set of editable word versions of every chapter page. Now these are plain text pages - very simple looking. These sample pages are actually designed for use with our Wizard software where our Wizard software will actually load in all of this text in place of our general-purpose default text and that's how our Wizard software can build you a custom version of every sample in the design theme of that you originally purchased and make that editable sample more tailored to your business proposal. See if we want to look at an example of a business plan there are a number of business plan related samples included. Overall there are thousands of pages of completed sample content for you to make use of however you see fit. Also included are manuals. That pretty much covers all the content that is included in all the hundreds of Proposal Packs and different ways it can be used. Some of our other products are legal Contract Packs so we have a number of contract packages. This is showing you our General Contractor's Contract Pack. These are collections of legal contract documents and to make use of them you simply scroll to whichever document that you want to use. Open it in your word processor and the wording is already there ready for you to edit as you see fit. These can be used as individual standalone documents you just open them in your word processor. They can also be used within our Wizard software where the Wizard can help you integrate your own name and address contact information more automatically. You can also import any of these contracts into the graphic design theme of a Proposal Pack. Lots of different ways this can be used. We also have Title Page Packs. These are simply replacements for that front Title Page design theme. Say if you want to change out the basic square blocks of the For Any Business design's Title Page. Each Title Page Pack has five designs and each one of these five designs in a Title Page Pack has 120 color schemes made up that you can pick from. Now these are all standalone documents in the Title Page Packs and they're best used with our Proposal Pack Wizard and our Proposal Kit Professional and Proposal Pack for Any Business. Our Wizard software can easily swap in any of these design themes automatically. You can still do it yourself manually. Its just a matter of copying and pasting one of these documents into one of the preassembled documents we've already created. 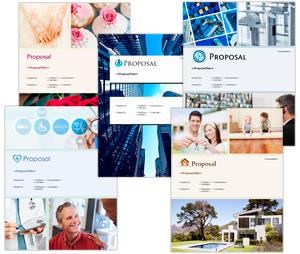 Our largest bundle is the Proposal Kit Professional. The Professional is a bundle of a number of different Proposal Pack, Contract Pack, Title Page Pack and other packages. When you open the Proposal Kit Professional organizer you can get to all of the contract documents across every one of our individual Contract Packs. You can also get to 4 different collections of templates and 5 different collections of Title Page Packs. The entire collection of hundreds of samples is included. Also something that's not sold separately, it's only included in the Professional bundle, is the Project Management Pack collection of documents. These are just extra material for records management projects and other project documents that don't fit so well into a proposal or contract package. They're all part of a bundle that we call a Project Management Pack and also additional estimate spreadsheets beyond what's just included in the individual Proposal Packs. So just clicking these access documents will actually take you to the organizers for all the sub packages and so on. Lastly we have the Wizard software. This is the one component that does require Microsoft Word for Windows. It does not run natively on a Macintosh because Microsoft does not include their Visual Basic for Applications automation system in the word for Mac version of Word now. The Wizard software is a tool that all of our hundreds of Proposal Pack and Contract Pack and Title Page Pack and Proposal Kit Professional products hook into. So whichever individual template packages you purchased you will access them automatically through the Wizard to build proposals. So we're not going to get too much into the Wizard here. Other videos will cover that. But that is the collection of products we have, how they all integrate together, how they all look and how you access them through these desktop organizers and the Wizard software interface.